2 1. Introduction to the Data Protection Policy Everyone who works for Chorley Council uses personal data in the course of their duties. Chorley Council must gather and process personal information about staff and customers in order to operate effectively. 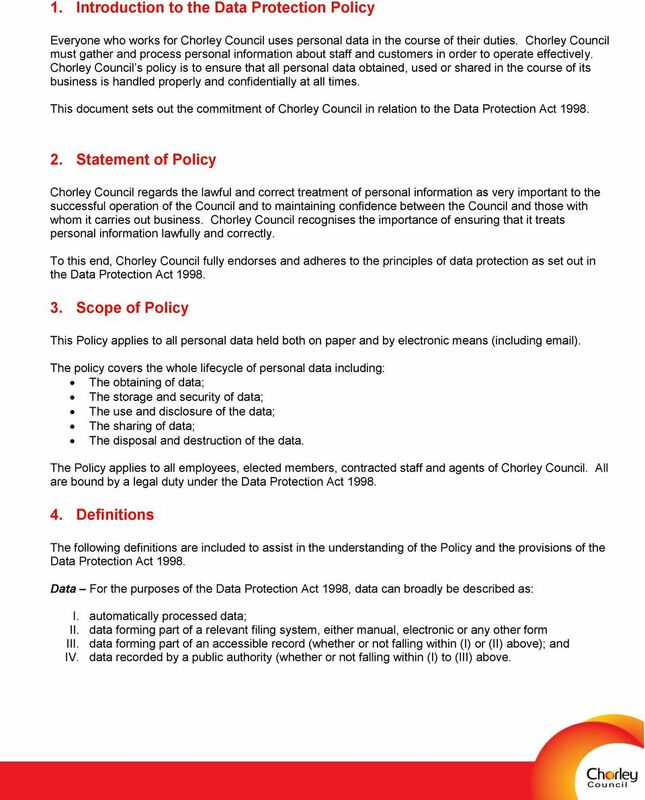 Chorley Council s policy is to ensure that all personal data obtained, used or shared in the course of its business is handled properly and confidentially at all times. 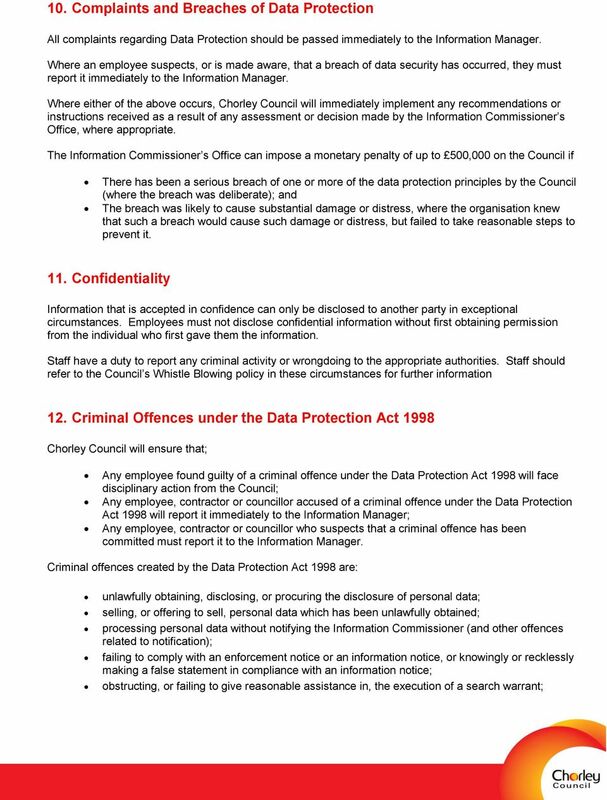 This document sets out the commitment of Chorley Council in relation to the Data Protection Act Statement of Policy Chorley Council regards the lawful and correct treatment of personal information as very important to the successful operation of the Council and to maintaining confidence between the Council and those with whom it carries out business. Chorley Council recognises the importance of ensuring that it treats personal information lawfully and correctly. 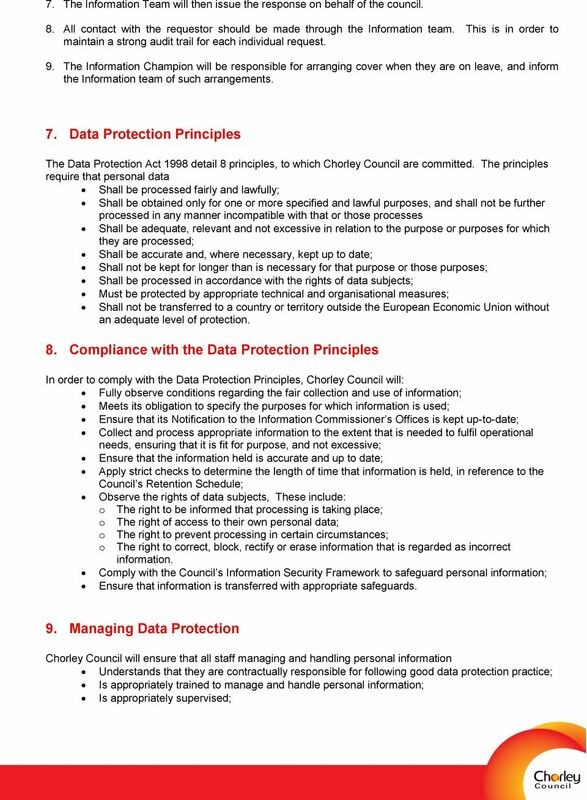 To this end, Chorley Council fully endorses and adheres to the principles of data protection as set out in the Data Protection Act Scope of Policy This Policy applies to all personal data held both on paper and by electronic means (including ). 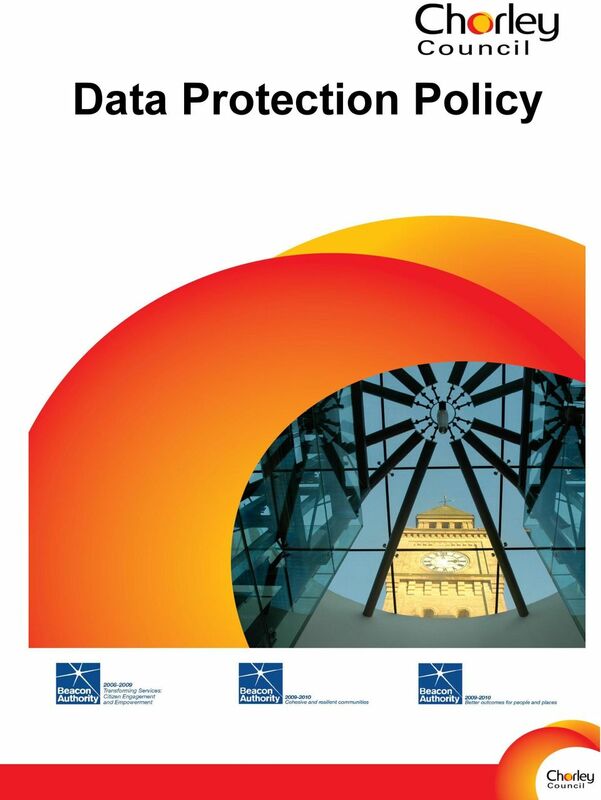 The policy covers the whole lifecycle of personal data including: The obtaining of data; The storage and security of data; The use and disclosure of the data; The sharing of data; The disposal and destruction of the data. The Policy applies to all employees, elected members, contracted staff and agents of Chorley Council. All are bound by a legal duty under the Data Protection Act Definitions The following definitions are included to assist in the understanding of the Policy and the provisions of the Data Protection Act Data For the purposes of the Data Protection Act 1998, data can broadly be described as: I. automatically processed data; II. data forming part of a relevant filing system, either manual, electronic or any other form III. data forming part of an accessible record (whether or not falling within (I) or (II) above); and IV. data recorded by a public authority (whether or not falling within (I) to (III) above. 3 Personal data Personal data means information about a living individual who can be identified from that information and other information which is in, or likely to come into, the data controller's possession Sensitive Personal Data - is personal data that relates to: The racial or ethnic origin of the data subject; His/her political opinions; His/her religious beliefs or other beliefs of a similar nature; Whether he/she is a member of a trade union; His/her physical or mental health or condition; His/her sexual life; The commission or alleged commission by him/her of any offence; Any proceedings for any offences committed or alleged to have been committed by him/her, the disposal of such proceedings or the sentence of any court in such proceedings Data Subject This is the living individual who is the subject of the personal information (data). Subject Access Request A written request made by an individual for access to their personal data. Chorley Council charges 10 per request. Data Controller - A person who determines the purposes for which, and the manner in which, personal information is to be processed. This may be an individual or an organisation (e.g. Chorley Council) and the processing may be carried out jointly or in common with other persons. Data Processor A person, who processes personal information on a data controller's behalf. Anyone responsible for the disposal of confidential waste is also included under this definition Processing Processing means obtaining, recording or holding the data or carrying out any operation or set of operations on data Notification Notification is the process by which a data controller's processing details are added to a register held by the Information Commissioner. Information Commissioner The Information Commissioner s Office is an independent authority, set up to enforce and oversee the Data Protection Act 1998, the Freedom of Information Act 2000, the Environmental Information Regulations 2004 and the Privacy and Electronic Communications Regulations The ICO s main functions are educating and influencing (promoting good practice and giving information and advice), resolving problems (resolving eligible complaints from people who think their rights have been breached) and enforcing (by the use of legal sanctions against those who ignore or refuse to accept their obligations). 5. 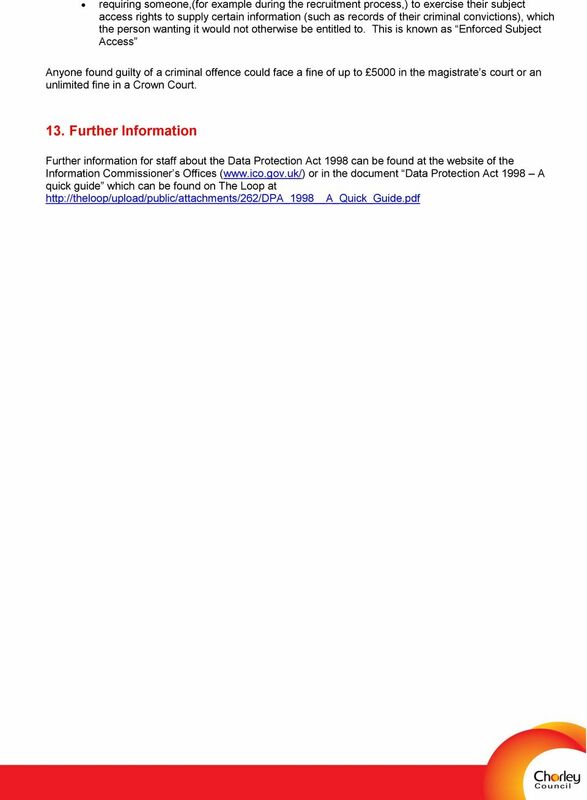 Notification Under the Data Protection Act 1998, the Council (as Data Controller), is required to notify the Information Commissioner of any data processing undertaken. This Notification describes how and why the Council used personal data. It is registered each year with the Information Commissioner and is a legal requirement under Part III of the Data Protection Act The Information Manager is responsible for maintaining the Notification. All Services must inform the Information Manager of any new service or project involving data processing, in order that the Notification can be amended. Notification on behalf of Electoral Registration Officer and Elected Members will be controlled by the Head of Democratic Services. 4 6. Responsibility Chorley Council will ensure that there is someone with specific responsibility for the effective administration of data protection within the Authority. This responsibility sits with the Information Manager. The main duties of the Information Manager in relation to Data Protection are: Maintenance of the Council s Notification, and acting as liaison with the Information Commissioner s Office; Development, updating and publication of data protection procedures and guidance for the Council; Ensure compliance with data protection procedures and practices; Be the initial contact point for all subject access requests; In conjunction with the Head of Human Resources and Organisational Development, provide training to all Council staff regarding data protection issues; Investigate instances of Data Security Breaches. All services will have an appointed Information Champion. 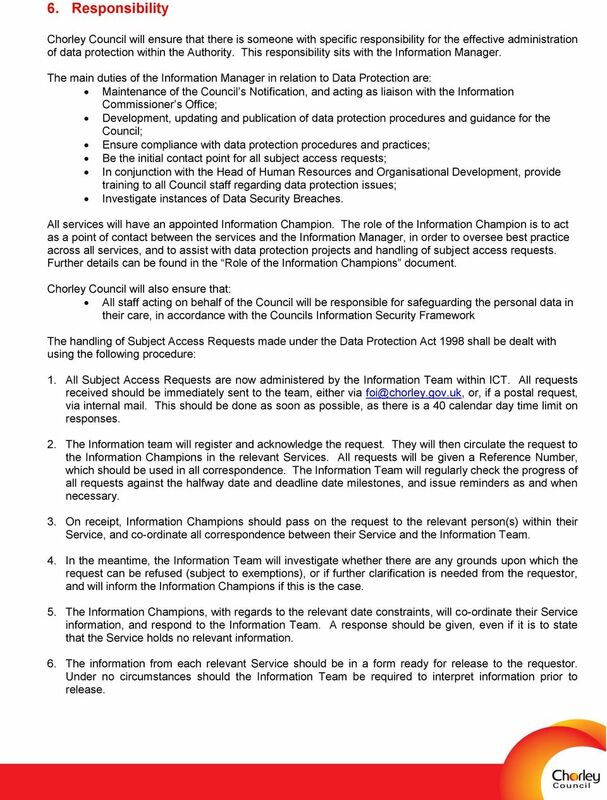 The role of the Information Champion is to act as a point of contact between the services and the Information Manager, in order to oversee best practice across all services, and to assist with data protection projects and handling of subject access requests. Further details can be found in the Role of the Information Champions document. 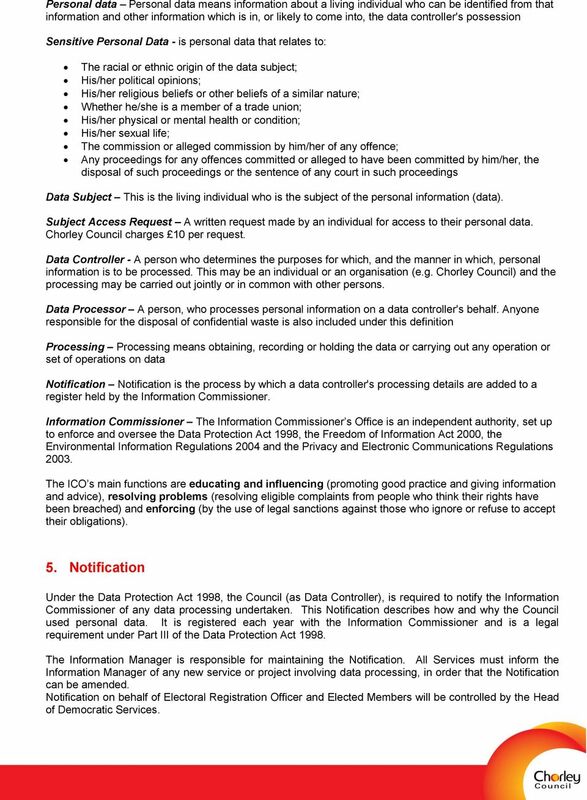 Chorley Council will also ensure that: All staff acting on behalf of the Council will be responsible for safeguarding the personal data in their care, in accordance with the Councils Information Security Framework The handling of Subject Access Requests made under the Data Protection Act 1998 shall be dealt with using the following procedure: 1. All Subject Access Requests are now administered by the Information Team within ICT. All requests received should be immediately sent to the team, either via or, if a postal request, via internal mail. This should be done as soon as possible, as there is a 40 calendar day time limit on responses. 2. The Information team will register and acknowledge the request. They will then circulate the request to the Information Champions in the relevant Services. All requests will be given a Reference Number, which should be used in all correspondence. The Information Team will regularly check the progress of all requests against the halfway date and deadline date milestones, and issue reminders as and when necessary. 3. On receipt, Information Champions should pass on the request to the relevant person(s) within their Service, and co-ordinate all correspondence between their Service and the Information Team. 4. In the meantime, the Information Team will investigate whether there are any grounds upon which the request can be refused (subject to exemptions), or if further clarification is needed from the requestor, and will inform the Information Champions if this is the case. 5. The Information Champions, with regards to the relevant date constraints, will co-ordinate their Service information, and respond to the Information Team. A response should be given, even if it is to state that the Service holds no relevant information. 6. The information from each relevant Service should be in a form ready for release to the requestor. Under no circumstances should the Information Team be required to interpret information prior to release. How much do I need to know about data protection?